Beko bring you the New Line Range of breakfast appliances, available at EPE. The New Line Range consists of two (TAM4321W) and four (TAM4341W) slice toasters; both feature wide slots, 6 settings and have a stylish and sleek look. 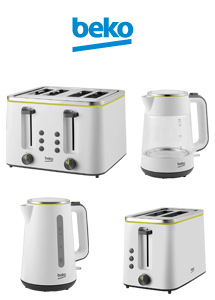 Beko didn’t just leave it with toasters as they have released 2 new kettles to compliment the range. The WKM6321W is a 1.7L glass kettle with 2.4kw if power; also available is the WKM4322W 1.7L 3kw kettle. Both feature 90˚ opening lid mechanism and anti lime scale filter.